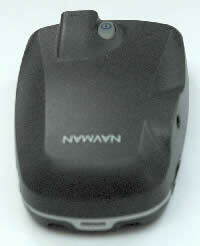 The Navman 4400 is a GPS Receiver which communicates via the Bluetooth wireless system. Designed primarily for in-vehicle use, it can also be used on foot too, in conjunction with a PDA. It comes with a range of mounting options for in car and mobile use. The Navman 4400 GPS was connected via Bluetooth to both a Compaq iPaq 3630 with a Tactel Bluetooth sled, and to a HP iPaq 5550 with integrated Bluetooth. Connection to both devices occurred smoothly and without any problems. 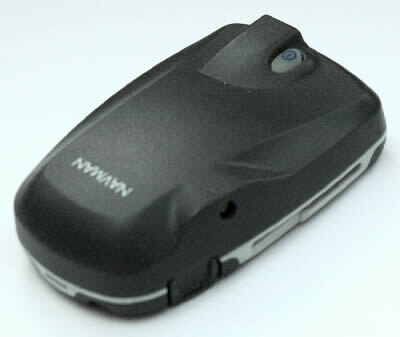 The Navman was switched on, and when the PDAs were set to scan for new Bluetooth devices, they easily located the Navman 4400 anywhere within a 5 metre radius - which is generally ample distance within a car, where the Navman 4400 would be most likely located on the dashboard or the rear shelf. The Bluetooth pairing process popped up a passkey window on the PDAs, and in both cases, it was easy to set the pairing passkey on the PDAs for the Bluetooth connection between the Navman 4400 and the PDAs. The Navman 4400 was tested for connectivity to a mobile phone, in this case, a Nokia N73 smartphone. The connection would not work because Navman use a alphabetic passkey rather than the more usual numeric password, and the Nokia N73 only provides an option to enter numbers. This was very frustrating, and resulted in the Navman getting considerably less use than would otherwise have been the case. The software included with the Navman 4400 is SmartST Professional Version. For use on the road, it works effectively, with street level mapping, but for any more detail, it is lacking compared to rival offerings. It is certainly not that detailed for walking or outdoors use in combination with a PDA. Navman produce street level maps for the UK, Ireland, France, Germany, Italy, Belgium, Netherlands, Luxembourg, Austria, Switzerland, Portugal, Spain, Norway, Denmark, Sweden amongst others, which does at least enable comprehensive road coverage. 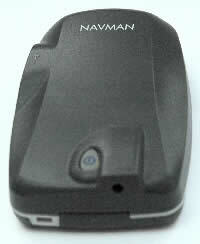 Slinging the Navman 4400 GPS in a rucksack or bag, and then using the PDA to navigate works well. The accuracy seems good, and the sensitivity is also good (apart from in Central London). The warmup time for satellite fixes seems a bit on the slow side, but that is because the chipset is not as responsive as the most recent chipsets, which is reasonable enough. The Navman 4400 works well in a car, although it is quite slow at re-calculating routes when a turning is missed or ignored. The biggest drawback in a car, is the fact that the time to first GPS fix is so long initially. Sitting there before setting out on a journey, waiting for the Navman 4400 to get a fix is tiresome. The Navman 4400 works well in a train, as long as you keep the device close to the window of the train. For use in a car, the Navman 4400 comes complete with a 12Volt car adaptor plug with a 2.1mm plug on the other end, to attach to the Navman 4400 for powering from the car. 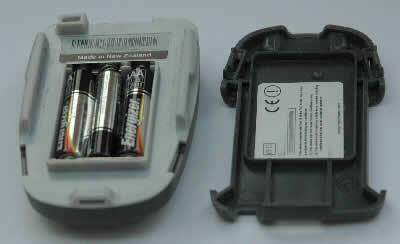 The Navman 4400 is powered independently by 3 AAA batteries. Battery life is good, and the Navman 4400 runs fine on both standard Alkaline non-rechargeable batteries, and on Nickel Metal Hydride (NiMH) rechargeable batteries. Sensitivity, the bugbear of many older GPS receivers, is also an issue here, in this case, more with the initial GPS fix time. For car use, the Navman 4400 is effective, albeit with less map detail out of the box than other offerings. For handheld use on foot, the handheld GPS receivers designed specifically for that use would be a better option.